00:33 In the storyboard, we have a few view controllers: the navigation controller; the episodes list; the detail view controller; and finally, the navigation controller, which contains the modal profile view. 00:51 In the code, we have three classes. The first two are simple: the ProfileViewController and the DetailViewController. The EpisodesViewController is a little bit more complicated. It's a simple table view controller, but it also has the prepareForSegue method, which we want to refactor. The prepareForSegue method distinguishes between two different segues and configures the respective view controllers. 01:34 Finally, there's the unwind IBAction, which gets a segue whenever the modal view controller is dismissed. 01:59 It's nice that the storyboard gives us a visual representation of how the view controllers are connected. 02:11 However, it's difficult to change the way the view controllers are connected, because not everything is done in the storyboard: we have segues in the storyboard, but we have the prepareForSegue methods in the view controllers. We need to be careful to ensure that the code matches up with the storyboard. Instead of having the connections in both the storyboard and the code, it would be nice to have a single place where this all happens. 02:44 First, we remove some segues from the storyboard. 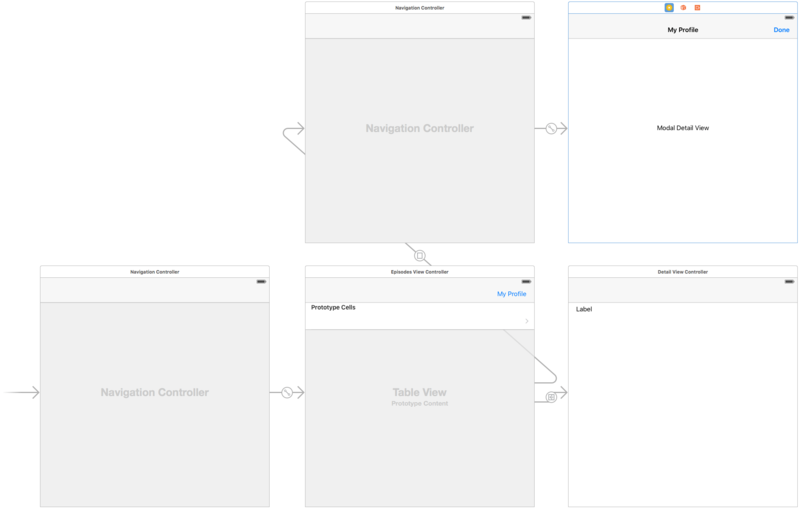 We'll keep the storyboard around for now, in order to define our view controllers and lay out views. 03:03 We remove the push segue, the modal presentation segue, and the unwind IBAction. 03:25 Now our storyboard is only used to define the view controllers. 06:03 The force casting isn't nice, but it's a result of us still holding on to the storyboard. We could get rid of it if we would instantiate all our view controllers in code, but as long as we use storyboards, we have to deal with force casting. However, we can create a central place where we do this — for example, in an extension on UIStoryboard. 12:44 This pattern decouples our view controllers: they don't know about each other and they don't present each other. They're connected in a central place outside, so the view controllers don't even know that they're inside a navigation controller. 13:02 However, it's not nice that all this code is still living in the AppDelegate. We need to refactor that. 14:27 One problem is that our App.init is a large blob of code. There are many callbacks, including callbacks inside callbacks. We should improve the code by factoring those callbacks out, since the callback situation will only get more complicated with time: each level in the navigation stack will result in another nested callback. 17:33 Having these method names really helps readability, as the named methods are easier to understand than all those nested callbacks. 18:28 The App class is a dense piece of code, but the rest of the code is very simple and decoupled. 18:52 One problem though: when you see a closure with a self reference inside, you start wondering if there are reference cycles. In our case, there aren't. For example, only the navigation controller references the profile view controller. Once you hit dismiss, the reference goes away. Still, having all these closures in your code might make you think: "Is this still good, or do I have to mark something as weak?" 19:27 When refactoring, it's also easy to introduce reference cycles accidentally. 19:51 Our approach lends itself well to creating more reusable view controllers. For example, we can introduce some generic view controllers to reuse in different places. Let's look at that in a future episode.